Join meditation teacher Kelsang Tsalden in meditation to relax, to enjoy, and to let go of stress and negativity. In these sessions, Tsalden will take participants through carefully guided meditations with a focus on how meditation can be used in daily life in helping to develop a peaceful, flexible mind. These classes are suitable for beginner and experienced meditators and for people of any faith background. Kelsang Tsalden is a Kadampa Buddhist nun who has taught meditation classes in Victoria and at Kadampa Meditation Centre Fraser Valley in Abbotsford. 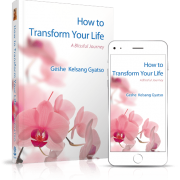 Tsalden draws from both her meditation and life experiences to make her teaching clear, meaningful and practical. May 6 Bye bye dissatisfaction!